Pictured above is a rough guesstimation of my intended route. I had originally planned to ride Adventure Cycling Association’s TransAmerica Trail, it goes across the width of the US from Virginia to Oregon and is about 3800 miles. But since I have the time and possess the right amount of crazy I decided to go for broke and extend it quite a bit. So instead of heading west from Virginia I decided to go south to the Florida Keys along the ACA’s Atlantic Coast route. From there I’ll wander my way up and out of Florida and eventually into Missouri where I’ll hop onto the TransAmerica trail about a third of the way in and follow it till I get to Whitefish, Montana. 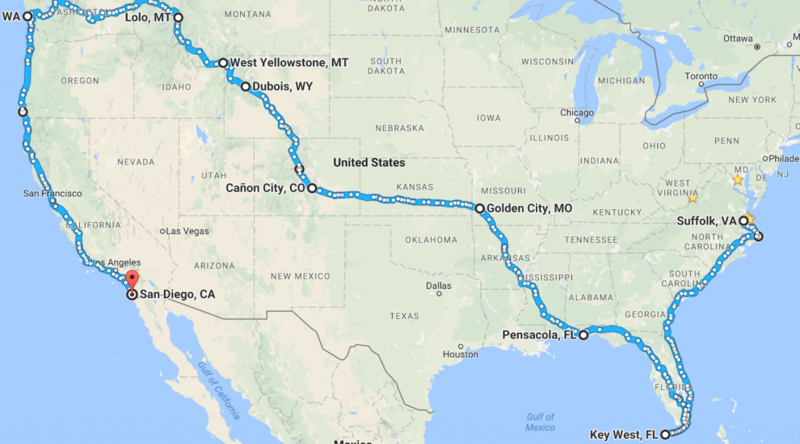 I’ll leave the TransAm there and make my way across Idaho and Washington until I get to the beginning of ACA’s Pacific Coast Route in Vancouver, BC. This route goes down the coast all the way to San Diego. The mapped out portion is around 6700 miles and I think it will take me about 5 months. My plan was to call it quits in San Diego but if I have the time, inclination and money to keep going then I’ll just keep channeling my inner vagabond and continue to peddle.